Town of La Conner, WA. 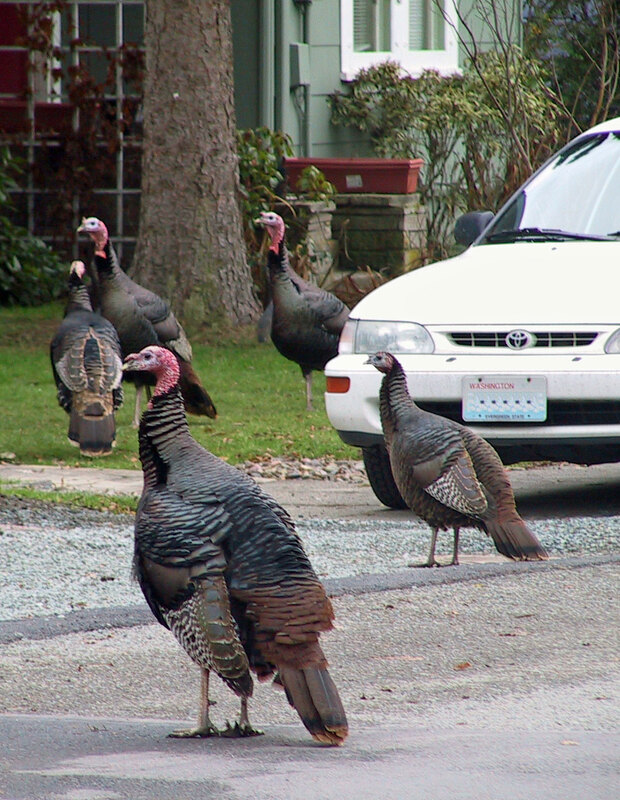 In early, 2005, a pair of wild turkeys descended from the sky and landed in the tourist town of La Conner, next to Puget Sound. Where they came from, nobody knows for sure. They soon gave birth and, by 2007, the flock had grown to eight. They quickly became a tourist attraction with a large following. It was common to see them strutting down main street past businesses, art galleries and museums occasionally holding up traffic. 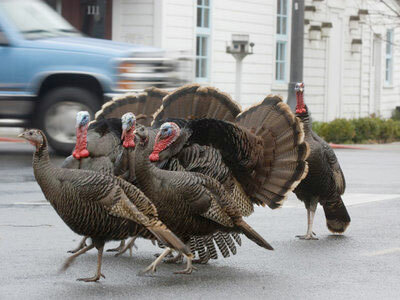 The turkeys were good for business so they were protected and proclaimed the Town’s official bird. By 2009, the flock had grown to eighteen. The once revered birds were now despised by a vocal minority of townspeople who vowed to get rid of them. The complaints ranged from the turkeys wreaking havoc in gardens, pecking at houses, leaving behind feathers and droppings, and being potential carriers of salmonella. The Fish and Wildlife alleged the birds could attack small animals and children. In early August, at a Town Council meeting, the members decided the fate of the birds. Two Council members wanted the entire flock euthanized and one member suggested the flock be used as targets for a youth fire arms safety course. At the next Town Council meeting (August 25, 2009), Mayor Hayes and a citizens group voiced their outrage in deciding the fate of the birds without their knowledge and without public input. Many of the townspeople and the Mayor spoke passionately in support of the turkeys. The Mayor demanded that animal control pursue options to find a humane solution. 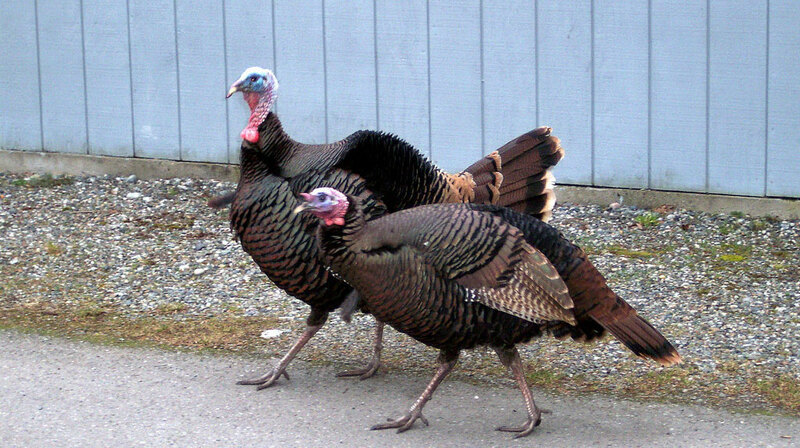 It was further agreed that a few turkeys would remain in La Conner. 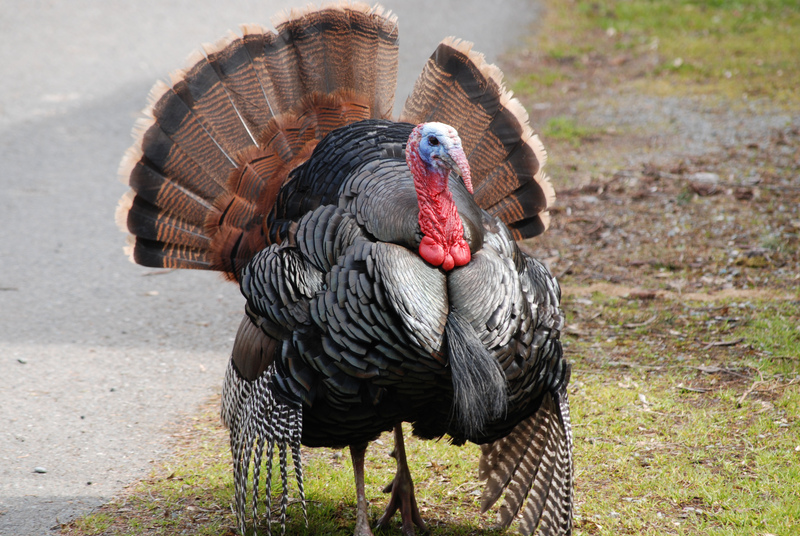 Precious Life Animal Sanctuary became aware of the La Conner turkey controversy and became one of a number of options. 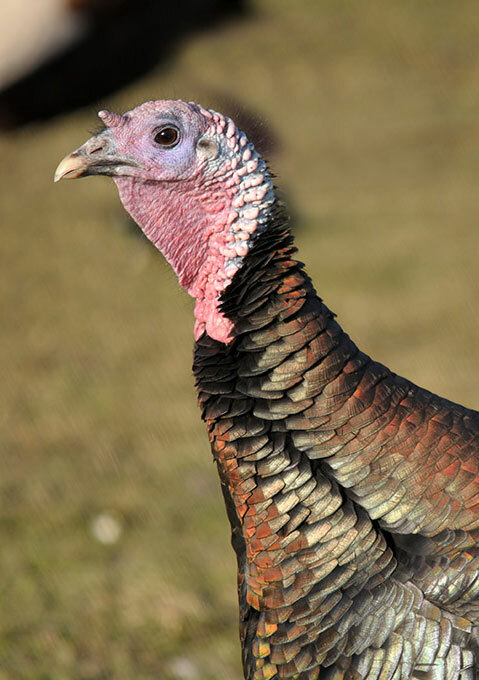 Animal Control investigated several interested farmers including an “adopt a turkey” program and it quickly became evident that none of the choices were in the best interests of the turkeys (bred to slaughter, hunting preserve, etc.). 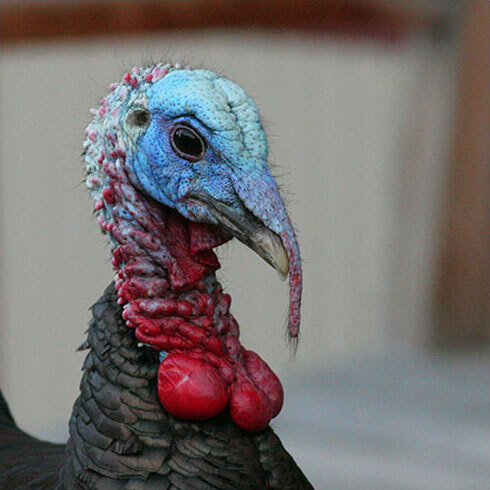 The Mayor and Animal Control selected PLAS as the only option that would provide long-term care and allow the turkeys to live out their natural lives. However, it was stipulated that the excess turkeys had to be removed in the following weeks. PLAS had little time to prepare as Animal Control immediately designed an enclosure to trap the birds to place them in transport cages. In early September, 2009, the first birds were picked up at the Port Townsend Ferry and the rest were driven to the sanctuary. A total of eleven turkeys were hauled by tractor to the top of the rabbit enclosure to a makeshift enclosure. It was small, less than ideal, and had little protection from the weather. 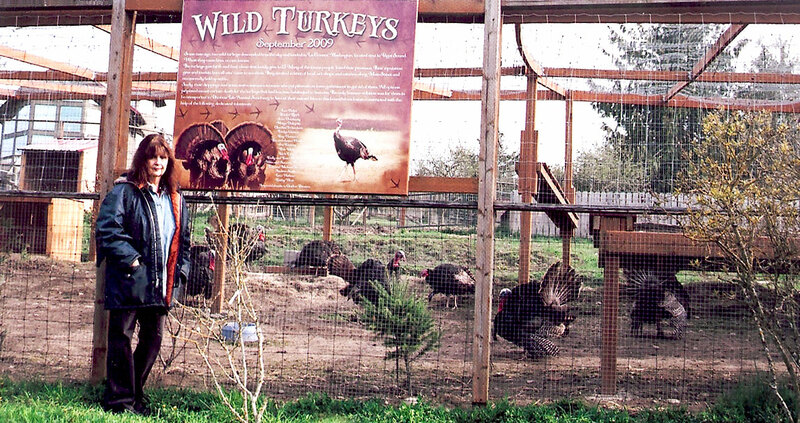 An all-out effort was immediately undertaken to build a permanent enclosure that had to be predator proof, high enough to allow the turkeys to fly and large enough to accommodate additional birds in the future. It was an expensive endeavor for the founders but fortunately constructed with the help of a loyal group of dedicated volunteers. In November, the turkeys were trapped which was no easy task and transported by tractor to their new enclosure. It was so gratifying to see that all the turkeys that had endured so much had made it and could experience their natural instincts by finally exploring their new home. (They are so comfortable, they have begun to lay eggs which we must gather to prevent reproduction.) A sign depicting their history hangs at the site complete with the names of all volunteers who were so instrumental in its completion. The turkeys are fascinating and all members of the flock are loyal to one another. When transporting the birds, several escaped and could have easily flown away. However, once they heard and saw the others, it was relatively easy to capture them. Presently, the males are strutting in their full-bloom of beautiful iridescent feathers to impress the females. The sounds they emit are sometimes loud gobbles, but, for the most part, are a series of gentle, soft chirps as they cover the ground searching for good things to eat. To augment their regular feed, they are treated to shelled peanuts, hulled sunflower seeds, cereal, grains and grapes which are their favorite. They are intelligent animals and easily recognize their caretakers and seem to enjoy when one spends time with them. 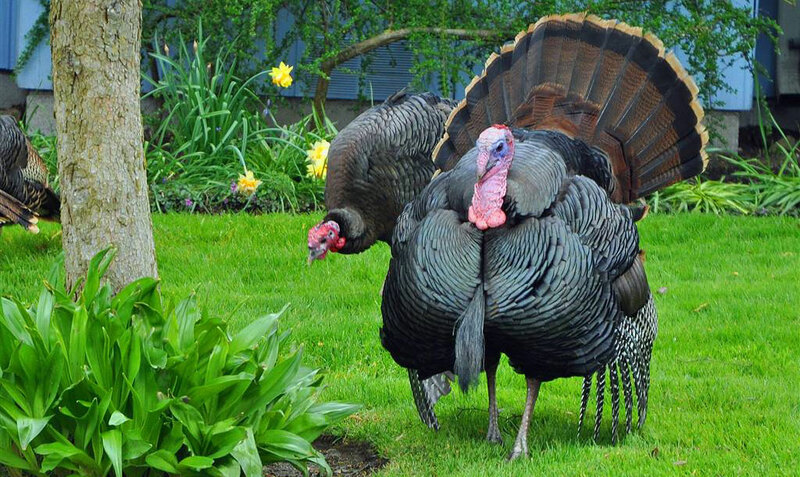 For these fortunate turkeys, there is a happy ending.